Time is valuable when it comes to the legal system. Between court proceedings there's a constant shuffle of attorneys, judges, etc. More and more, virtual court appearances are being used to save time and money and provide a convenient alternative to lawyers, judges and the many others involved in the justice system. 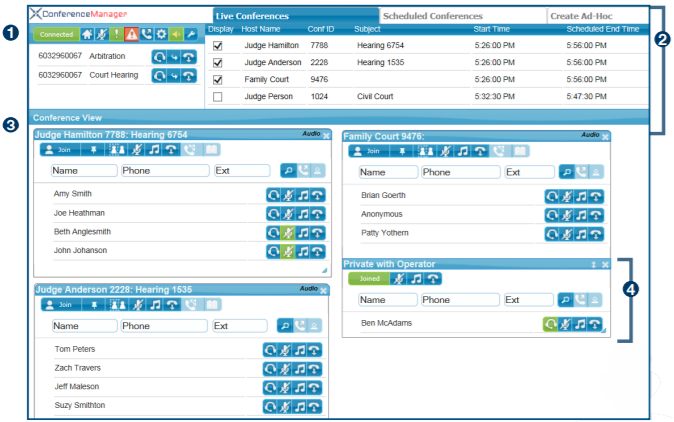 Sonexis CourtConnect, powered by the ConferenceManager™2, is a powerful telephonic solution for virtual court proceedings that helps to minimize the hectic nature of this system, allowing attorneys and judges to attend hearings remotely. Sonexis CourtConnect allows users to schedule and manage remote appearances for court proceedings of all kinds. It provides seamless access to connect judges, attorneys and other parties for hearings, trials, mediation, arbitration and more. This comprehensive solution for telephonic court appearances is adaptable, innovative and intuitive and integrates with most existing court tools available today. The Operator Console interface is a user-friendly application that helps facilitate remote depositions, testimony, and a wide range of other activities throughout Federal, State, and Local Courts. Using this tool a dedicated moderator can manage multiple active virtual court rooms at a time - muting noisy lines, tending to participants who remotely "raise their hand" for acknowledgement, etc. - as well as facilitate the transition between cases - privately prompting lines who are next on the docket and more. See below for a view of our CourtConnect call management interface. Virtual Court is no longer a vision for the future. This is why Sonexis has teamed up with ATI Connect, a leading systems integrator, to provide a custom solution specific to serving the virtual court system. VCourt, powered by Sonexis and ATI, allows users to schedule and manage remote appearances for court proceedings of all kinds. It provides seamless access to connect judges, attorneys and other parties for hearings, trials, mediation and arbitration. This comprehensive solution for telephonic court appearances is adaptable, innovative, intuitive and integrates with most existing court tools available today. Streamlining the court system with Sonexis and ATI technologies ultimately helps to increase productivity and save valuable time for all involved. To view learn more about ATIs VCourt solution, click here. Sonexis is a brand of Compunetix, as part of its Communication Systems Division, and a leading provider of collaboration and conferencing solutions for enterprises of all sizes. Connecting businesses with their customers, partners and employees through a powerful audio, web and HD video conferencing platform that's easy-to-use, secure and cost-effective, Sonexis sets itself apart as a unique and reliable provider. Sonexis conferencing solutions are designed for on-premises or cloud based deployments and are engineered to provide the most flexible and dynamic conferencing experience for the enterprise. For over 25 years ATI Connect has been one of the leading systems integrators providing clients with voice and data applications supported by the highest level of professional services in the industry. ATI Connect creates custom solutions to fill technology gaps within existing systems. Our goal is to improve your bottom line with integrated applications tailored to optimized business processes, customer experience, and workforce productivity.